OPENING SESSION | Wed., Oct. 3, 2018 | 10:30 a.m. – 12:00 p.m. If you listen to NPR, then you know Maureen Corrigan’s voice. For more than 20 years, Corrigan has been the book critic for NPR’s Fresh Air. She is, undoubtedly, America’s most trusted and beloved book critic, and a busy bibliophile. Her typical day starts at 4 a.m. to tackle the more than 200 books delivered to her house each week. Her library, as you might expect, runneth over. Corrigan will talk about her love of reading for work and pleasure, the authors and books that have played a key role in her life, and how she gets people in the classroom, in print, and on NPR excited about the transforming power of literature. Corrigan is also a professor at Georgetown University and the author of two books of her own: Leave me Alone I’m Reading and So We Read On: How the Great Gatsby Came to Be and Why it Endures, which was named one of the ten best books of the year by Library Journal. GENERAL SESSION | Thurs., Oct. 4, 2018 | 10:15-11:15 a.m. Living with kindness, empathy and love provides benefits for both the giver and receiver. Studies show that these types of expression might slow aging, decrease pain and create a higher sense of emotional warmth that reduces stress and heart-health risks. For those on the receiving end, a greater sense of inclusion and value contribute to stronger emotional brand engagement. Workplaces with a culture of kindness, empathy and love also have lower staff turnover and greater effectiveness. This culture ripples out from individuals to others in the workplace, to patrons and throughout the community. Learn how Lance Werner, Executive Director, Kent District Library, created a coveted work culture at his library by implementing this mantra of kindness, empathy, and love. His approach was so successful with staff that the concept was turned into a new approach to customer service, termed the “KDL Way.” During this session, you’ll learn ways to implement this relationship-based approach at your library and create a more genuine style of management and customer service that focuses on individual needs. CLOSING SESSION |Fri., Oct. 5, 2018 | 12:45-1:45 p.m. In an early example of cultural appropriation, Jamie Ford’s great-grandfather changed his name from Min Chung to William Ford—it’s been an adventure ever since. Ford will talk about the historical background of his books and how he came to write about subjects so close to his personal past. He’ll discuss the challenges (and comforts) of growing up bi-racial, and writing multi-cultural fiction in a world of Twitter outrage, sensitivity readers, and political correctness. 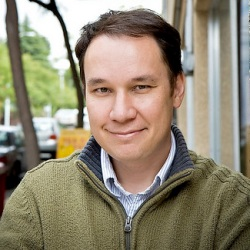 Jamie Ford is the award-winning author of the best-selling novel Hotel on the Corner of Bitter and Sweet, which was awarded the Asian Pacific American Award for Literature and was on the New York Times best-seller list for more than two years. Ford’s second novel, Songs of Willow Frost, was also a New York Times best-seller. His latest work, Love and Other Consolation Prizes, is inspired by true events and is an unforgettable story of a young orphan boy from China who was raffled off as a prize at the 1909 Seattle World’s Fair.